Controversial social scientist Charles Murray and Freeman Spogli Institute senior fellow Francis Fukuyama discussed inequality and populism at the Hoover Institution on Thursday night in the second of four Cardinal Conversations, a program that aims to promote open political discourse on campus. Michael McFaul, director of the Freeman Spogli Institute and a co-leader of Cardinal Conversations, opened the event with a call for dialogue that is “challenging, intellectually and normatively.” He also called for more student engagement in the Conversations program, both in terms of leadership and audiences. “I’m thrilled to see students here tonight, but there are not enough,” McFaul said. 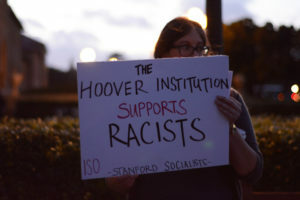 Additionally, he noted the counter-programming taking place directly outside the Hoover Institution and encouraged free speech for speakers and protesters alike. Ferguson then took the stage alongside Murray and Fukuyama. After introducing both speakers, Ferguson dove into one of the evening’s prescribed topics — inequality in America — by asking Fukuyama about his stance on American “plutocracy” and why the right, not the left, seems to have become the vehicle for white, working-class anger in the age of Donald Trump’s presidency. “Now, unfortunately, I think the kind of identity politics that had been more on the left has now drifted over to the right,” Fukuyama said. Trump — “a classic populist in the mode of Juan Perón or Mussolini” — won by capitalizing on that discontent, he added. Ferguson then brought up the protesters outside who had gathered in opposition to Murray’s presence. Murray responded that he would not meet Ferguson’s conception of racist, wherein racism is the belief that certain groups are superior to others. However, he noted that under the “equality premise” — wherein “differences in group outcomes must be evidence of some sort of discrimination” — his argument in his 1994 text “The Bell Curve” that “there are differences in personality and abilities” both between and within racial groups would indeed label him a racist and a sexist. Murray went on to defend the academic validity of the controversial book, although Fukuyama added that it would be “very imprudent” for an author to not consider “the impact that [a work] has on the broader society,” with “The Bell Curve” perpetuating white supremacy. Ferguson then pivoted to the idea of class hierarchies and inequalities, citing Murray’s idea of a “cognitive elite” that has restructured society so as to perpetuate its own power. But populism, Fukuyama said, is not inherently bad; the anger fueling it can be directed towards positive change, like President Franklin Roosevelt’s welfare programs. Rather, Fukuyama identified the threat of populists as coming from their tendency to oppose institutions and checks on their power. Other problems have fueled shifts in allegiance among working class whites, too. The speakers discussed changing pride in class identity, decreased intermingling between the elite and labor classes, and — as was made evident in Trump’s winning campaign — changes in immigration and demographics. Writ large, the speakers disagreed on the root problem of these social ills. “[Murray’s] explanation is completely cultural… and [he leaves] out all of the structural issues,” Fukuyama said. The night ended with a question and answer session, after which Ferguson promoted the next Conversation — which will feature Anne Applebaum and Ted Koppel — and thanked the students and staff who’d helped support the program. Only a few hundred feet away from the Conversation, on the steps of The Quad’s History Corner and spilling out onto the surrounding pavement, students gathered to protest the event — and particularly Murray’s invitation to speak at Stanford — at the “Take Back The Mic” rally. Michael Ocon ’20 organized the rally with the Coalition of Concerned Students to give students of color a platform to speak out against Charles Murray. In an interview with The Daily, Ocon called Murray a eugenicist and accused him of making ethnic minorities feel vulnerable on campus. In the opening speech of the rally, Ocon said that protesters were here to stand against white supremacists, whom he believes have found a platform on campus. Dereca Blackmon, associate dean and director of the Diversity and First-Gen Office, placed the Thursday rally in historical context, comparing it to a 1968 event in which members of the Stanford Black Student Union (BSU) took the microphone from then-Provost Richard Lyman during a speech and read aloud a list of demands. “I’m here because as an administration we need to do better,” Blackmon said. David Palumbo-Liu, professor of Comparative Literature, argued that Murray’s presence on campus was a symptom of the University undermining minorities. “Universities welcome diversity, but they shut it down when it’s too real, too abrasive, when it could actually change the way that we understand things,” Palumbo-Liu said. Earlier this year, The Stanford Review called on Palumbo-Liu to either resign or dissociate himself from his group, the Campus Antifascist Network. During Tuesday night’s Undergraduate Senate meeting, ASSU Senate Chair Kojoh Atta ’20 encouraged his fellow senators to attend the “Take Back the Mic” rally. At the rally, fellow Senator Doris Rodriguez ’20 performed an original spoken word piece. Student speakers represented organizations such as the BSU, American Indian Organization, Asian American Students’ Association (AASA), Muslim Student Union, Students for Justice in Palestine, International Socialist Organization, Jewish Voice for Peace and the Solidarity Network. Zach Kirk ’20, an event organizer and BSU representative, said that Provost Persis Drell and President Marc Tessier-Lavigne’s support for the Murray event is a continuation of the University’s historical support for eugenics. Kirk pointed to David Starr Jordan and Lewis Terman as examples of former Stanford faculty who supported eugenics, yet still have their names featured on campus buildings today. They also chanted the second phrase with reference to Tessier-Lavigne instead of Drell. Multiple speakers at the protest criticized Murray on academic grounds and for promoting “pseudoscience,” in the words of both Ocon and Blackmon. Protesters also stressed the need to make reforms to the Cardinal Conversation program. Kirk said that while he believes Cardinal Conversations is important, the committee that decided to bring Murray to campus was representative of neither the student body nor political spectrum on campus, adding that he and other protesters wanted to change this aspect of the program. “We’re not only here to protest, we’re here to make internal change too,” Kirk said. In an interview with The Daily, Palumbo-Liu criticized the prominence of the Hoover Institution in organizing Cardinal Conversations, arguing that it lent a partisan bias in the programming. Murray’s appearance at Middlebury College on Mar. 2, 2017 turned violent when students and non-College affiliates disrupted his attempts to speak, resulting in a faculty member being injured. Following the incident, Middlebury took disciplinary action against 67 of its students. Palumbo-Liu told The Daily that he was “not concerned” about any violence erupting at Stanford, emphasizing that Middlebury students and community members were specifically reacting to the college president introducing Murray. “If David Duke were invited and Marc Tessier-Lavigne introduced him, you’d get upset, too,” Palumbo-Liu said. Outside of Cardinal Conversations, other controversial speakers have been brought to campus and received financial compensation funded by ASSU student fees. In November 2017, Stanford College Republicans invited self-proclaimed Islamophobe Robert Spencer to speak about radical Islam, stirring similar controversy about free speech and inclusion. Nearly 300 Stanford community members organized a counter-protest and walk-out from Spencer’s speech, resulting in verbal and physical altercations. In contrast, the Murray protest organizers did not plan a walk-out, and according to Ocon and Kirk, the counter-programming was primarily designed to uplift communities being targeted by Murray’s writings. Michael Whittaker contributed to this report. Contact Brian Contreras at brianc42 ‘at’ stanford.edu, Yasmin Samrai at ysamrai ‘at’ stanford.edu, Melissa Santos at melissasantos ‘at’ stanford.edu and Sarah Wishingrad at swishing ‘at’ stanford.edu.